I first heard of Ron Meyers in second year at Sheridan, during one of our weekly morning chats with Tony Clennell. Each week we were given a new form to throw, be it cups, bowls, teapots or covered jars. First thing in the morning, we would sit around the table with Tony and start the day with tea, coffee and show and tell. Tony would bring in pots from his own collection, to show us some possible forms. 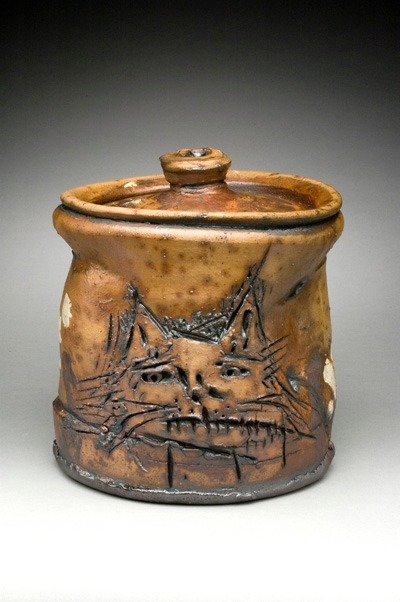 The teapot that Tony brought in of Ron Meyers' was grungy, eerie and hysterical all at the same time. Tony likes to joke that the teapot looks like it has been fired at with a shot gun - I agree with him. The piece looked bent, it had a crunched knob, and it was decorated with primitive clay smudges and stick scratches. I loved it. I had never before seen a piece of pottery that was so casual and confident. The marks of the maker were prominent and strong; he didn't try to cover up the touch of his hand, he emphasized it. 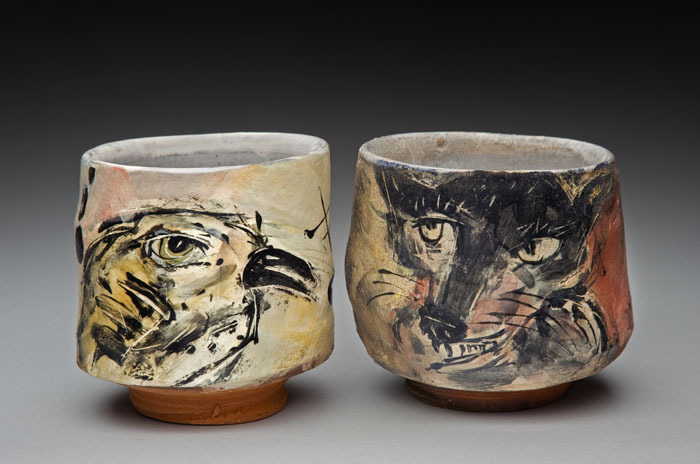 Since that morning coffee break I have fallen head over heels with Ron's pots. He is quite easily my favourite potter. At Sheridan we were lucky to have several of his demo pieces in the collection, and I spent lots of time admiring them and trying to gain some "looseness" in my work as well. I think what I admire most about his work is that IT'S HARD TO BE CASUAL, but he masters it. I have tried to make my pots gestural, for them to stand and slouch as humans do, informally. They only look sloppy and unintentional. Ron's pieces make sense. They exude confidence and reference the underground in a way that is witty and wise. 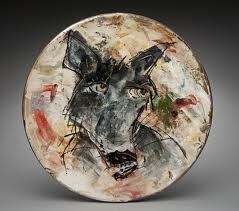 The animals he carves or paints onto the surfaces are evil and mysterious, with no lack of character. I am in awe of all that this man does. If I worshipped a god, he would be it. This past weekend, Pinecroft Centre for the Arts hosted Ron Meyers for a weekend long workshop. Tony's family started Pinecroft 60 years ago - it continues to be the longest running pottery in Canadian history. 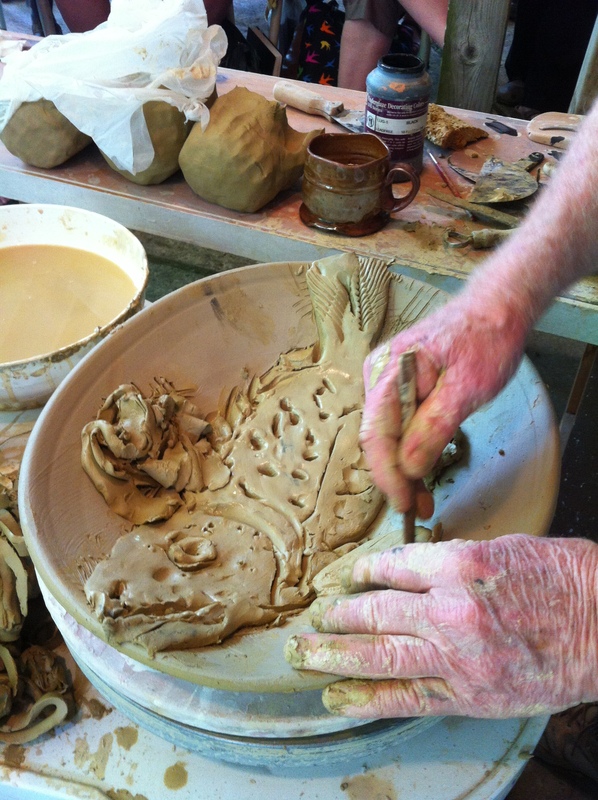 I attended the workshop on Saturday, and was able to meet Ron for the second time and finally watch him make some pots. The way he works is directly reflected in the way his pieces turn out - he is casual, he is confident, he exudes strength and mystery and knowledge. These attributes are all noticeable in any given piece. I already have one piece of Ron's in my own collection (remember that Cow plate from my blog entry "Cattle" in March? ), but I see many more in the future. Bats, frogs, rats, birds, cats, dogs, pigs? I just can't control myself.